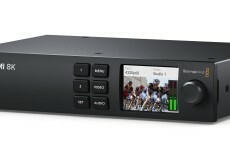 Blackmagic Design announced Teranex Mini SDI to HDMI 8K HDR, a new advanced 8K HDMI monitoring solution with dual on screen scope overlays, HDR, 33 point 3D LUTs and monitor calibration for professional, color accurate SDI monitoring on HDMI 8K screens. Teranex Mini SDI to HDMI 8K HDR will be available in May 2019 from Blackmagic Design resellers worldwide. Teranex Mini SDI to HDMI 8K HDR is an advanced 8K monitoring solution for large screen televisions and video projectors. Unlike basic converters, Teranex Mini can use third party calibration probes to accurately align connected displays for precise color. There are 2 on-screen scopes that can be selected between WFM, Parade, Vector and Histogram. Teranex Mini SDI to HDMI 8K HDR is perfect for film studios and broadcasters who need professional but affordable color accurate monitoring. Customers also get an elegant design with color LCD for monitoring and control of settings. Teranex Mini SDI to HDMI 8K has everything for the latest HDR workflows. All that’s required is to connect a HDMI display to get HDR SDI monitoring. Static metadata PQ and Hybrid Log Gamma (HLG) formats in the VPID are handled according to the ST2108-1, ST2084 and the ST425 standards. Teranex Mini SDI to HDMI 8K HDR handles ST425 which defines 2 new bits in the VPID to indicate transfer characteristic of SDR, HLG or PQ. Plus the ST2108-1 standard defines how to transport HDR static or dynamic metadata over SDI. Plus there is support for ST2082-10 for 12G SDI as well as ST425 for 3G-SDI sources. Both Rec.2020 and Rec.709 color spaces are supported and 100% of the DCI-P3 format. Two fully independent on screen scopes are included so compliance with broadcast standards is easy when doing critical high end work. Scopes are overlaid on screen so customers can customize position, size and opacity. Customers can select from a range of scopes, including waveform for displaying luminance levels of their input signal. The vectorscope display allows customers to see the intensity of color at 100% SDI reference levels. Customers also get RGB and YUV parade displays which are ideal for color correction and checking for illegal levels. Histogram shows the distribution of white to black detail in their images and highlights or shadows clipping. Teranex Mini SDI to HDMI 8K HDR includes the same high quality 33 point 3D LUTs as used in the film industry. It's even possible to calibrate the connected display by connecting a third party USB color probe and Teranex Mini SDI to HDMI 8K HDR will analyze the monitor and generate a 3D LUT to correct for color differences between displays. Two independent 3D LUTs can be loaded and customers can select between them from the front panel. All Quad Link 12G-SDI inputs have outputs for looping to other equipment. Plus all HD, Ultra HD and 8K standards are supported allowing broadcast or film industry use. In 720p customers get support for 50p, 59.94p up to 60p. In 1080i formats, customers get 50i, 59.94i up to 60i. 1080p, 1080PsF as well as 2160p formats are supported from 23.98 to 60 fps. Customers even get support for 2K and 4K DCI film formats from 23.98p to 60p. 4320p 8K formats are supported at 23.98, 24, 25, 29.97, 50, up to 59.94. With 2SI to Square Division conversion built in, an 8K source will be automatically converted for the monitor. Teranex Mini SDI to HDMI even handles both Level A or B 3G-SDI plus YUV and RGB SDI formats. The front panel LCD provides confidence monitoring with both images and accurate audio level meters. There are menus for all functions and it’s easy to scroll through menus "pages" to find settings that need changing. The 3D LUTs can be enabled just by pressing 1 or 2 buttons. Calibration is also started via the menus and customers simply follow the prompts to calibrate their display. The audio meters can even be switched between VU or PPM ballistics. HDMI instant lock can be enabled to ensure the HDMI display locks instantly if the input video is interrupted. There are settings for configuring scopes, their on screen location or opacity. Customers can even view and edit network settings. "We are exciting to announce the new Teranex Mini SDI to HDMI 8K HDR because it provides a monitoring features we have not offered in the past," said Grant Petty, Blackmagic Design CEO. "While we have SDI to HDMI converters in our product range, this new model includes many more features for monitoring. The built in scopes, Hollywood quality 33 point 3D LUT's, automatic probe based calibration and native 8K are advanced features that will dramatically improve workflows for our digital film and broadcast customers!" * Includes support for HDR via SDI and HDMI. * 2 built in scopes live overlaid on monitor. * Film industry quality 33 point 3D LUTs. * Supports automatic monitor calibration using color probes. * Advanced Quad Link 12G-SDI inputs for 8K. * Down converts 8K to Ultra HD or HD monitors. * Includes LCD for monitoring and menu settings. * Utility software included for Mac and Windows. * Supports latest 8K televisions and projectors. * Can be used on a desktop or rack mounted.